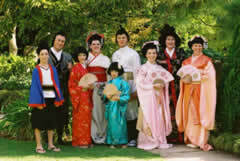 Join the Gilbert & Sullivan Society of SA in May when they stage the all-time favourite, The Mikado! The son of the Mikado is missing and his intended bride is on the hunt for her prey! Meanwhile, the Lord High Executioner of Titipu is annoyed to find that his fiance is enamoured with an itinerant wandering minstrel. Join Ko Ko in the town of Titipu and be part of his "little list" for this comic and musical celebration of all things Japanese! With its blend of humorous satire and wonderful music, The Mikado is a great night out for the whole family.